Thee boys reunite over a lost childhood, in both ways. Tragedy reunites childhood friends Sean (Kevin Bacon), Dave (Tim Robbins) and Jimmy (Sean Penn) when they’re linked together in the Boston-based murder investigation of Jimmy’s teenage daughter. But while detective Sean works the case, Jimmy launches his own quest for the truth. 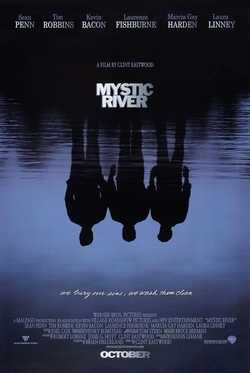 Mystic River is Clint Eastwood’s 24th directorial effort and it is one of his best. This is an extremely well-crafted and powerful film that shows us the real feelings of a childhood lost. Mystic River is based off of the novel from Brian Hegeland which works both as a taut thriller and a important character study. After seeing all, the critical acclaim this film has gotten I will say that I was expecting to be taken away with one of the greatest films I have ever seen. But to be truly honest I wasn’t. Much of the story is great but there are some plot holes that I just didn’t believe such as the plot concerning Sean and his wife how she always calls but doesn’t say a word. Also Tim Robbins’ character as a young boy was molested, and throughout the whole movie he just acts like a nutcase, and throughout the whole time I was thinking, how did this guy have a smoking hot wife and a kid. I liked how the film shows how these three men’s lives were changed when the incident with Tim Robbins occurred. The film isn’t a fast-paced thriller, but features elements that everything mysterious and wrong all lurk in the air. Its a tremendously powerful film about the American tragedy that features characters that I did actually believe. I felt like the setting they were in was very true and actually was a character in the movie itself, and how each character reacts with one another felt true as well. The performances are what really captivated me in this film however. The whole star-studded cast does a great job and all the performances jell together really well when their all on screen at once. Sean Penn gives one of the best performances of his career, and shows that he can take your typical average working American and switch him into something more than just that. There is a scene where he finds out his daughter has been killed and it is amazing to see his reaction, that scene though so early in the film kept me standing in my one spot. Tim Robbins does a great job as well despite his character being a little nutty, but he plays him real well. The problem with this film that ultimately killed it for me was the ending. I don’t want to give anything big away but the ending was total junk. I felt that by the end of the film it was supporting murder, and vigilante justice, and didn’t make any sense or create a feeling of anything was right in this film. Consensus: With some upsetting plot holes, Mystic River is well-acted, suspenseful, and full of great emotional power that shows a great portrait of real characters in real situations. Brilliant film, this made our “best of the decade list”!! !